Mrs.Chen Liu’s maiden name was Tei Honme （本目貞）. The house of Honme which was originally named as Matsudaira（松平）, was a “Hatamoto”（旗本）, a samurai household serving the Tokugawa Shogunate（德川將軍）. Tei was born on October. 20, 1898 as the sixth child of Teijiro and Kiyo Honme（.本目停次郎、喜代） She had three elder brothers, two elder sisters, and two younger brothers. When she was five years old, her father took Tei for a walk in the Kagurazaka（神樂坂） area of Tokyo one evening and, by chance, they encountered Gunpei Yamamuro（山室軍平） of the Salvation Army（救世軍） who was preaching the Gospel by the roadside. Her father was deeply moved and determined to believe in Christ. This marked the beginning of the Honme household’s acceptance of Christianity. Tei and her second elder sister Kiku were baptized together as small children on May 18, 1902 and started to attend Sunday-school（日曜學校）. They wore wooden clogs and walked two hours to church, not missing a single Sunday in many years. Tei attended Okubo elementary school（大久保小學校）from age seven until she was admitted to the senior section of the same school. In 1913 Tei was admitted to Aoyama（青山） Girls High School, a Christian mission school, thanks to the strong recommendation made by her Sunday school teacher, Tadako Hibi（日比忠子） who liked Tei and was greatly impressed by her talents. She was awarded a full scholarship based on her excellent academic record.. In 1917 Tei advanced to the English Department of the Aoyama Women College （青山女學院）and graduated after three years of study. She was then certified to teach English in middle schools. Tei taught English and physical education courses at I-ai Girls High School in Hakodate City, Hokkaido（北海道函館市遺愛高等女學校） and also participated in the activities of the YWCA there. In April 1922 she was called back by her alma mater, Aoyama Girls School to teach in the high school section. While Tei was senior at Aoyama Women College, a Taiwanese student living in the dormitory where she served as head of the room was Shiuchin Liu（劉秀琴）, who had been brought to Japan by her brother（劉青雲）, Chinyun Liu. Chinyun was the eldest son of Suisan Liu（劉瑞山）, the head of a noted family in Tainan, Taiwan. After two-year study at Tainan Presbyterian middle School（台南長老教中學）, Chinyun went to Japan to study at Kyoto Doshisha Junior School（同志社高等普通學校）, and then attended Keio University（慶應義塾大學） in Tokyo where he obtained a Bachelor’s degree in economics（理財學士） in 1921. He brought Shiuchin and their brothers, Chuan（主安） And Tsushan（子祥）, with him to attend school while he was studying in Tokyo. As his sister’s guardian, Chinyun met Tei who took good care of Shiuchin. Mutual respect and admiration soon turned into longing for each other. Tei and Chinyun were married on Noverber 8, 1922. The matchmaker was Yoshimune Abe（阿部義宗）, president of the Aoyama Women College. The wedding was conducted by Rev. Kodo Ozaki（小崎弘道） at Reinanzaka Church（靈南坂教會）in the Akasaka District（赤坂區）, Tokyo. After their marriage, Tei followed her husband back to Tainan, Taiwan, the hometown of Chinyun Liu, and lived there. The couple raised a daughter and four sons： Chingli（慶理）, Kaitsao（改造）, Koshin（革新）, Yimin（逸民） and Peishi（備世）, who all became accomplished. During her entire life, Tei’s religious belief was pure and firm. In Tainan, she joined a Shirogane cho Church（白銀町教會）, a church of Japanese Christians. 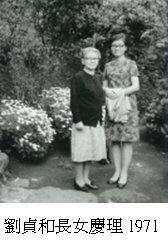 There she played organ for church services, and served as choir mistress and also as an elder（長老） of the Church. In 1932 the Japanese Methodist Church was planning to establish a church in Tainan City and sent Rev. Kazuichi Fujita（藤田一市） to Tainan. Once a month the Methodists met at Tei’s home for their church meeting. In 1934 Rev. Keiichi Inoue （井上慶一； his wife： Yiren Lin 林玉蓮） came to Tainan and in 1935, the Kotobuki-cho Church（壽町教會） was officially established as a Methodist church, where Chinyun ad Tei acted as representatives（代表者） of the church members. This church continued under the guidance of ministers such as Rev. Moriharu Murayama （村山盛春）and Rev. Danpei Kaino（戒能團平） until the end of World War II. At the end of the war, Tei helped many Japanese people who were sent back to Japan including the mayor of Tainan City,.Matao Hattori（羽鳥又男） and his family. After the war Tei participated diligently in the activities of the “Tainan Japanese Bible Meeting”（台南日語聖書集會） with her home and the home of her friend, Chiyo Lin（林千代） serving as the gathering places for the members. The record of the meetings ended in September 1981. 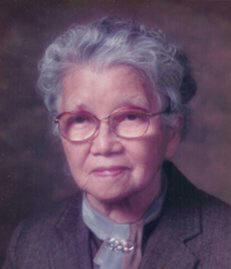 After her husband Chinyun passed away on March 9, 1982, Tei went to live in the United States with her sons and daughter frequently and during her stay she participated in the services of Taiwanese Christian churches there. In December of 1989 she went back to her “hometown” Tainan to spend her last several years； there she attended the Poai Presbyterian Church（博愛長老教會）. Tei liked read books and she was never tired of reading the Bible.